Mascus, the fastest-growing online marketplace in the world for the sale of transportation vehicles, construction machinery, agricultural, material-handling equipment and forestry, is now making it even easier for customers and dealers to stay up to date with their Mascus presence, with the launch of a new mobile website. The new mobile website is designed to increase accessibility and will benefit both dealers and customers by providing an easily accessible portal that can be viewed on mobile devices. This gives all of Mascus’ customers and dealers on-the-go accessibility. 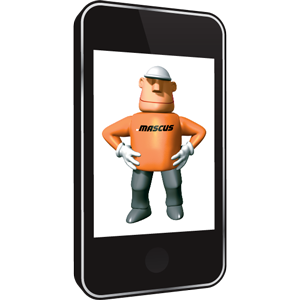 For dealers, the m.mascus.com Dealer Mobile enables them to see, update and maintain their Mascus profile on mobile devices such as smartphones, as well as manage their online content and search the world’s largest database of new and used plant machinery. Using specially developed software that directs browsers straight to their website, the Dealer Mobile gives sellers the chance to move their stock into a customized solution provided by their local sales representative. This gives instant access to their inventory, allowing them to update, move and evaluate their online stock at any time and anywhere. It is the mobile accessibility that makes the new m.mascus.com portal unique. “We realise that dealers are often away from their offices and out on site,” explains Mascus Sales Director Rickard Krøtø. “So rather than waiting until they get back to their office, the mobile website means that they can check their Mascus online profile while they are on the go. That means they can make quicker decisions if necessary, as well as reacting to inquiries from interested buyers. We believe the new mobile website will encourage dealers to visit their Mascus portal more frequently, and provides a truly up to date service for our customers,” he adds. Meanwhile, customers can also access the mobile website to browse listings that are broken down into easy to navigate categories. When customers click on a listing, they will see the seller’s product photos (up to 6), product details, pricing and location information. Customers can then call the dealer’s number right from the listing to make their inquiry. This innovative new website is part of Mascus’ continual improvement plans to deliver a comprehensive and unrivalled service to all their customers. “The mobile website takes Mascus to a new level by making it a more flexible portal for everyone to use,” explains Fredrik Larsson, Managing Director of Mascus. “We recognized the importance of producing a system that is user-friendly, no matter what environment it is accessed in, and that includes via mobile devices. Online technology is encompassing mobile devices to a much greater degree, so producing a mobile website that makes Mascus accessible on the go was a logical step for us. It also reinforces our commitment to continual improvement,” he adds. The website has been trialled and has proven to be so successful that it is now being rolled out across the brand. As smartphones become the norm and broadband connectivity brings more remote regions within reach of the Internet, Mascus believes that the new site will prove to be extremely popular with Mascus customers and dealers across the world. “Mobile technology is the future of the Internet, and by introducing our own mobile site now, we believe we are at the cutting edge of both technological advances and in delivering a better quality service to our customers,” comments Fredrik Larsson. “We are delighted that it has been so popular in its early trials, and believe it will pave the way for more mobile applications and additions to our service in the very near future,” he concludes.